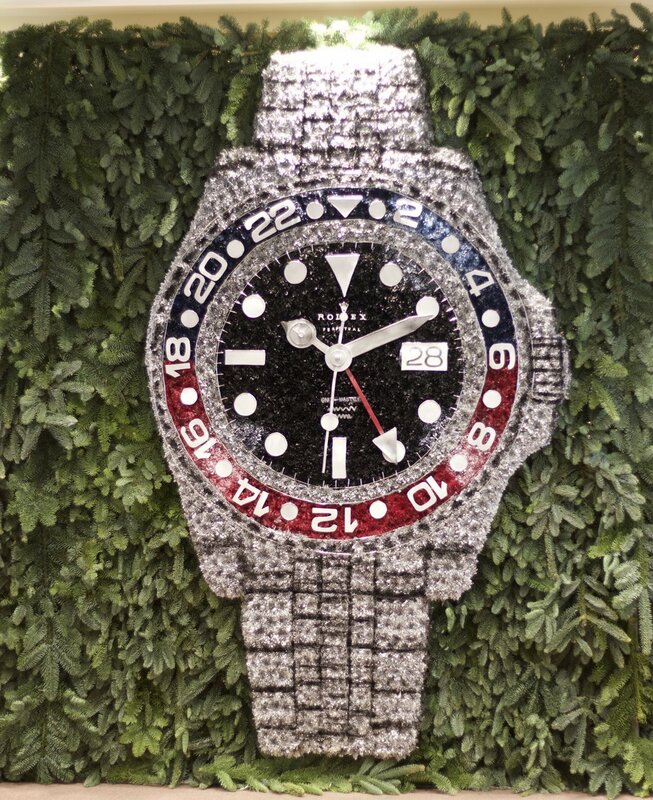 I was asked to create a 7ft tall replica Rolex watch made out of flowers. The finished result went viral on LinkIn and has currently been viewed by over 263,000 people. So I thought I would share how much time, thought - AND worry!! - went into producing this amazing piece, of which I am so proud. 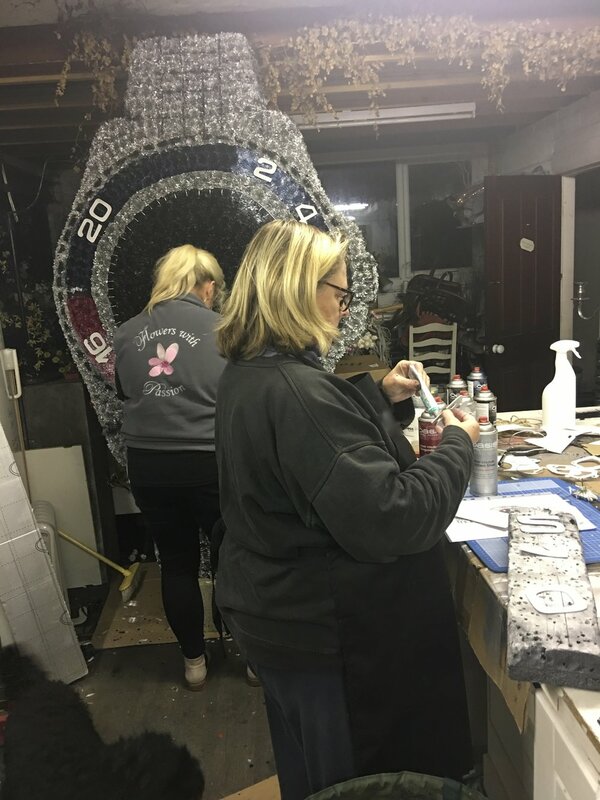 It all started with an email from the lovely team at Whittles Jewellers in Preston on September 17th. They were having a VIP Rolex event on November 16th - in their newly extended and modernised store - and needed something around “7ftx7ft” to cover their Omega watch display. I was asked for a price for a flower wall. I rang for a few more details and between us we discussed a “wall” of spruce (green is Rolex’s brand colour) and a giant watch of flowers in the centre. Between you and me my brain was saying I couldn’t possibly do this but as usual I found my mouth opening and saying yes, of course. How exciting!! It took me a weekend away to let me brain compute all that would be necessary to attempt such a huge project. Problem 3: The watch itself. I have a large cuttings patch at our Goosnargh home to grow flowers for the shop and my many weddings. In the summer we have to surround the raised beds with a framework of wire netting to stop the rabbits and pigeons eating everything. I had just removed all the frameworks for the winter and thought they would be ideal (and free!) for the spruce. I measured them and worked out four along the bottom and four on top would give me the measurements needed - which ended up being 8ft x 8ft. Thank goodness for my very dear friend Simon Elcomb who made the panels for me in the first place. Although my hubby gave me a welding machine three years ago - for Christmas!! - I have yet to find the time to learn how to use it!!!!! So off I went to the local metal fabricator in Garstang - the very patient and understanding Austin Walmsley. I think he has got used to my strange requests now! I sketched out what I had in my mind - basically a solid heavy piece of metal along the bottom (it had to fit into our van lengthways), then a series of upright poles in which I could slot the panels once I was at Whittles. I knew it would be easier to create the spruce wall in smaller panels and it also made transportation much easier too. The upright poles had to be hollow so I could slot another pole into each one to give me the height I needed - Again, better for the weight and logistics of getting it to the shop and carrying. Just the base needed three of us to carry. A week later we went to collect it. Huge thanks to Austin. The picture below shows the lower half of the metal stand with two of my rabbit panels sitting inside. PROBLEM 2 SOLVED. Where to begin??? Lots of sleepless nights ahead. Planning, thinking, sketching. Staring and staring at the picture that was sent to me by Whittles……. How on earth could I replicate THAT in flowers??!! 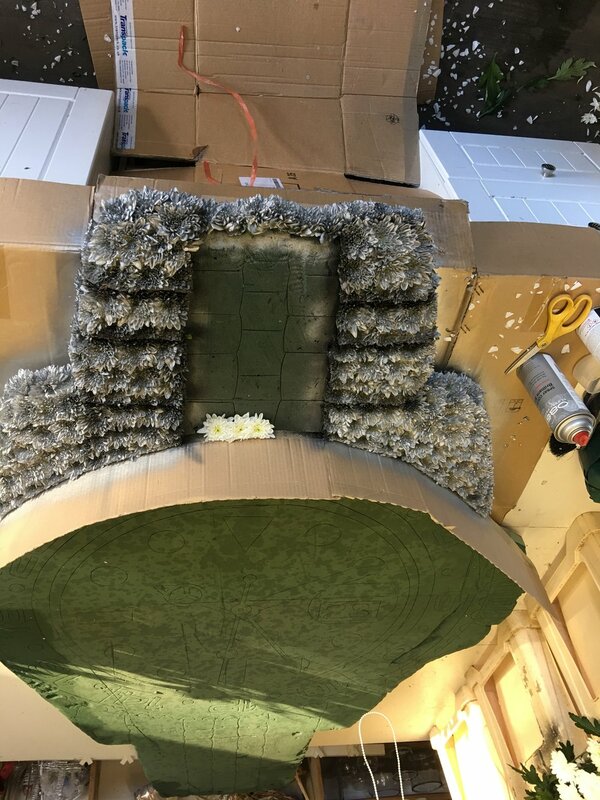 Step 1: First thing to do was to get in touch with Val Spicer, the company which creates bespoke floral foam shapes - mostly for use as funeral tributes. Could they even make a floral foam shape 210cm tall?? Yes, they could. Step 2: Order the flowers - where do you start guessing how many you need? The week before I’d created an Arsenal shield funeral tribute. I knew how many stems of white chrysanths I used for that so worked out how many Arsenal shields would fit into the giant watch. 400 stems were ordered. Step 3: Work out what colours of specialist floral spray paint I would need. - Black, White, Grey, Silver (two different shades), Burgundy, Pink, Blue, Navy - to be honest I just bought a load!!! And being a florist who loves painting I already had most colours in stock!! It took 12 cans of paint to complete this masterpiece! Step 4: How much spruce would I need? I practised on one quarter of one of the panels, worked out how much spruce one panel would take then multiplied it by 8. Simple! Although when I tried working it out the wholesalers hadn’t started importing spruce as yet. It was touch and go whether anyone would have some in time. I did contemplate chopping down an enormous - but beautiful - tree in my garden. Luckily 10 very large bunches of spruce arrived just in time. My ever-patient and supportive hubby, and right hand, Carl next to the first panel to be spruced - by the lovely Emma Smith. Seven more to go! Step 5: Will the watch frame arrive in time? 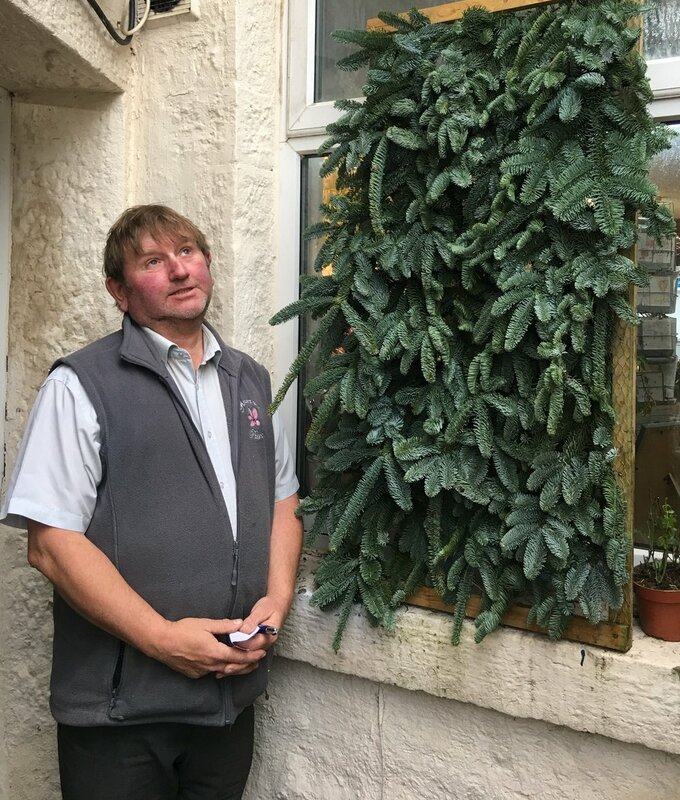 It was touch and go but finally a special delivery from my local wholesalers Peter H Smith - it needed two men and one van to get it to us as it was too big and heavy to put on a normal delivery! Hadn’t quite visualised how big this frame was going to be! We couldn’t leave it outside the back of the shop in case it rained. But it was too big to deal with inside our tiny working area. The watch went back to where my floral journey first started - my studio at home. Aka THE GARAGE! We got the flowers in a week before the event to give them time to open fully before I started working on the piece. The lovely Jill Wade who is currently studying for the same level 5 degree as I did in 2010/2011 and who is coming to us for work experience spent the full day cutting branches of spruce into smaller pieces, shaving off the thick end into a point and artfully arranging each and every piece into the 7 remaining panels. The patience of a saint! The work begins. I spend the day starting with the bottom strap of the watch. Each chrysanthemum head (I used around 2000 in total) was shaped to each square/rectangle shape of the strap by cutting various petals off. It helped enormously that the segments had already been grooved into the floral foam by Val Spicer. Although as soon as I added flowers I lost the grooves!! The cardboard was added to help me get the exact shape around the clock face. Part of the day was spent foraging in the garden and preparing the flowers I’d bought for a demonstration at Romily Flower Club the following night,. Each and every “link” of the strap I sprayed silver, then sprayed the edge black. I also used some grey and some white shading as I went along, It took me most of the day but the bottom strap was done. I thought about doing the watch face but bottled it. Felt more confident doing the top strap but knew it was a long day ahead, especially as I had to travel to Romiley Flower Club. A repeat of Sunday but I had to stop at 3pm to get the flowers and myself ready for my evening dem. A pause from the watch. Part of my displays for Romily Flower Club. Decided to do the outer edge - purely because I couldn’t stretch across my work area to reach the centre! Lots and lots and lots more layers of chrysanthemum heads. Three rows. To make sure I had the circle exact every chrysanth head on the outer and inner sections had to be cut almost in a semi circle. Only on the central part could I place the flowers without having to trim them first. I started with the blue section which I sprayed in three different blues and a bit of black to get the depth of colour right. Then it was on to the burgundy. Several coats of paint later and then I could turn the watch round and do the other side. Last but not least a flash of white, pale pink and pale blue paint to get the shading right. Emma came over on her way home from the shop to give me some moral support and see how things were progressing. Perfect timing. (Pun intended!!) I realised I had to stand the watch up so I could reach the centre. Between the two of us we managed to stand it up and attach it to the beams of the studio so it couldn’t fall over. RESULT - as we stood back to have a look I couldn’t believe how it already appeared to be 3D. Well chuffed, albeit it hungry and aching and desperate for a gin!! I had been at it from 8am-7pm. Back to the shop because I was the only one in and I had a wedding the following day and needed to create my magic for the lovely Joanne and Craig. Sadly I didn’t manage to get any pictures of their wedding or flowers. The first wedding of almost 450 that I failed to get photographs. My last full day to finish the watch. We had to deliver it early the next morning. Time to tackle the face. Because the flower heads were going to be black I had to individually spray each head with four coats of black paint. As chrysanths get older the petals unfurl and I didn’t want any white petals showing through the next day. I also had to finish the outer layers of silver and do some more shading on the straps. On Friday night I was demonstrating at Bakewell Flower Club so also had to prepare my flowers for that. Emma called in on her way home from the shop to give me a much needed boost. And at this stage we were able to start adding the circles, the numbers and the hands. All of which I had spray painted in various shades of grey/silver to stop them being too dominant. Emma made the 62 shapes of wire that made up the outer face of the watch and painstakingly worked out where each one had to be placed. We then laid silver aluminium wire around the black and burgundy rings to give some definition and finish it all off. Strangely one of the fiddliest bits of detail was adding some clear pvc over the top of the date. We didn’t want it to stand out too far but also didn’t want it to be flat. Just the last bits of finer detail to add - the writing. At 8.30pm I went indoors to make a start on the finishing touches - the Rolex name, crown and writing. It was a late night! I used my tiniest embroidery scissors to hand cut the letters. The word Perpetual was the most challenging as you can see in the middle two pictures below. 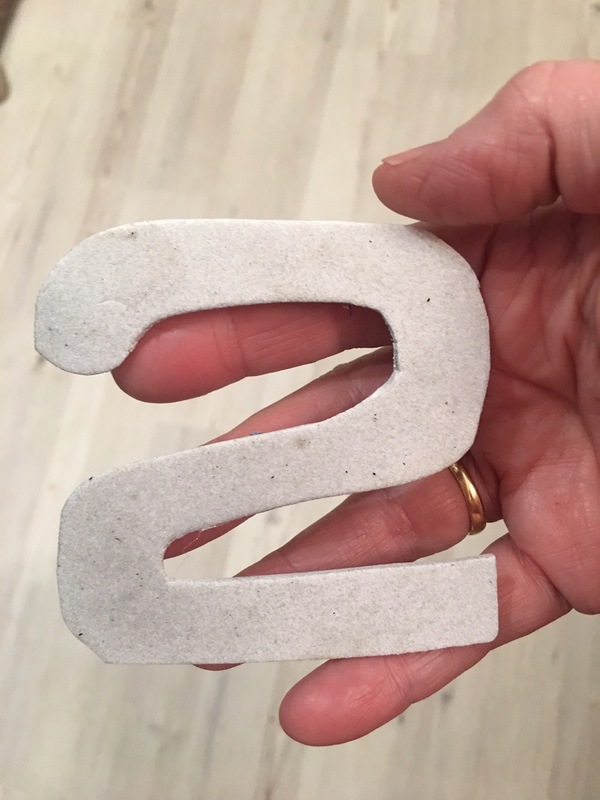 The GMT-Master lettering was too tiny to cut out so I made each letter out of a fine silver metallic wire then glued them onto a bit of pvc cut from a small clear pvc box we use to put corsages in! I didn’t get time to photograph these until after the watch was taken apart so the pictures below show the letters looking a bit bashed and the touches of black on them are the remains of a few black petals! It was up very early to finish off the lettering and get the van packed up to deliver to Whittles by 8.45am. We had to take the van and the car to get everything in. Thankfully all my pre-planning with sizes of the panels, the watch and the framework worked out perfectly to fit everything in. Emma, Carl and I spent the entire morning at Whittles. We put up the framework, added the panels with lots of cable ties, hoisted the watch into place with lots more cable ties then filled in all the visible gaps with lots more spruce. The audible gasp from the team at Whittles when we carried in the watch was praise enough! Job done. The watch was in place for one night only and Carl and I had to go back the following day to take it down. All that work for one night only. I couldn’t bring myself to get rid of it so for a few days it appeared in our shop window in Longridge. A few weeks later and I have now removed all the flowers, kept all the shapes and numbers and the framework. 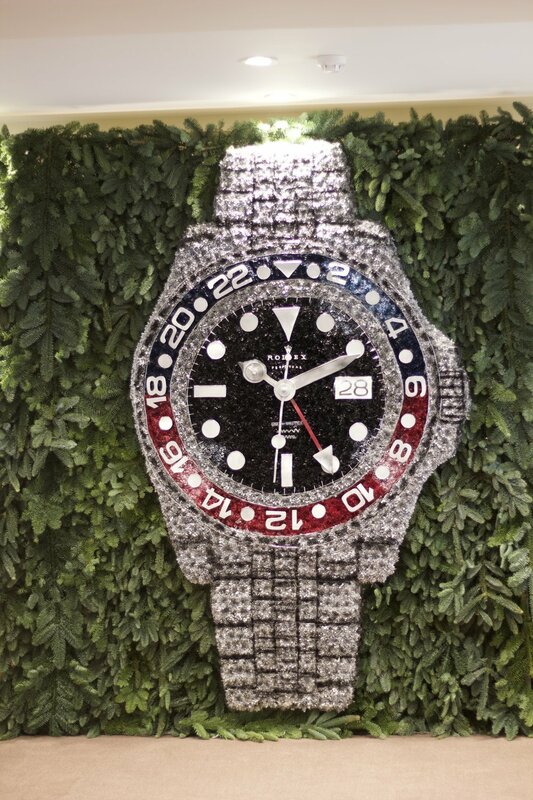 You never know someone else might like to order a watch in the future. Commissions eagerly awaited. But I fancy doing something else - anyone??!! An enormous thank you to everyone who helped in the making of this beast. I couldn’t have done it without you. And special thanks to my amazing Flowers With Passion team - my gorgeous hubby Carl, Emma and Jill. Team Passion rocks.